Tiburon, CA.—November 12, 2014—Jon Peddie Research (JPR), the industry's research and consulting firm for graphics and multimedia, today announced estimated graphics chip shipments and suppliers’ market share for 2014 2Q in its Market Watch quarterly PC graphics market report, an industry reference since 1988. Graphics processors, stand-alone discrete devices, and embedded processor-based GPUs are ubiquitous and essential components in all systems and devices today - from handheld mobile devices, PCs, and workstations, to TVs, servers, vehicle systems, signage, game consoles, medical equipment, and wearables. New technologies and semiconductor manufacturing processes are taking advantage of the ability of GPU power to scale. The GPU drives the screen of every device we encounter—it is the humane-machine interface. The third quarter is typically the big growth quarter, and after the turmoil of the recession, it appears that trends are following the typical seasonality cycles of the past. AMD’s overall unit shipments decreased 7% quarter-to-quarter, Intel’s total shipments increased 11.6% from last quarter, and Nvidia’s jumped 12.9%. The attach rate of GPUs (includes integrated and discrete GPUs) to PCs, for the quarter was 155% (up 2%) and 32% of PCs had discrete GPUs, (flat from last quarter), which means 68% of PCs today are using the embedded graphics in the CPU. 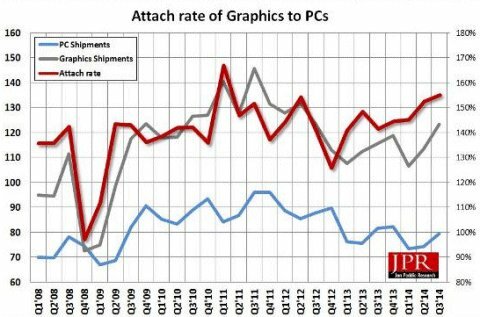 The overall PC market increased 6.9% quarter-to-quarter, and decreased 2.6% year-to-year. Desktop graphics add-in boards (AIBs) that use discrete GPUs increased 7.8% from last quarter. For PC and mobile device related companies small and large, new to the industry or established, it is critical to get a proper grip on this highly complex technology and understand its future direction. In this detailed 50-page data-based report , JPR provides all the data, analysis and insight needed to clearly understand where this technology is today and where it's headed. This fact and data-based report does not pull any punches: frankly, some of the analysis and insight may prove to be shocking. Click here to learn more about this major report, or to download it now. Or, for more information call call 415/435-9368 or visit the Jon Peddie Research website at www.jonpeddie.com. Fill out this form for contacting a Jon Peddie Research (JPR) representative.